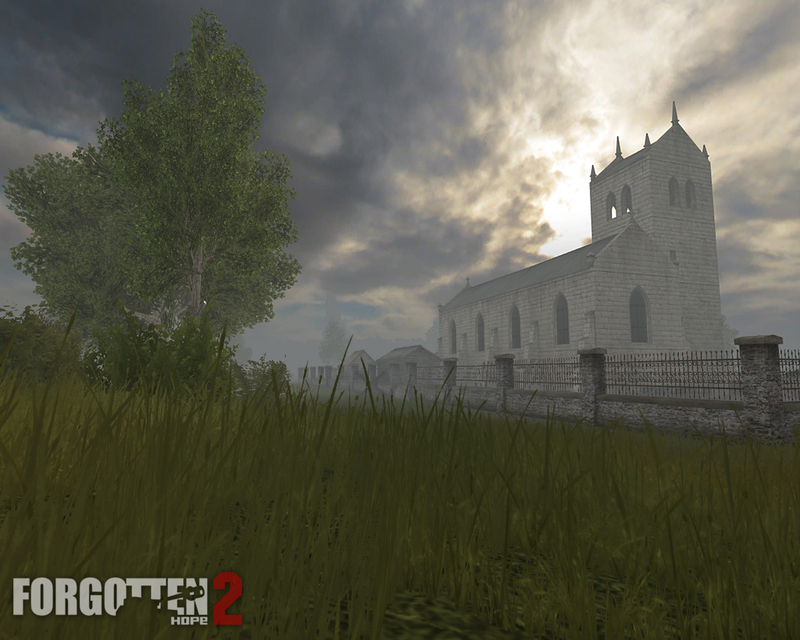 Hello and welcome back to another update of Forgotten Hope. 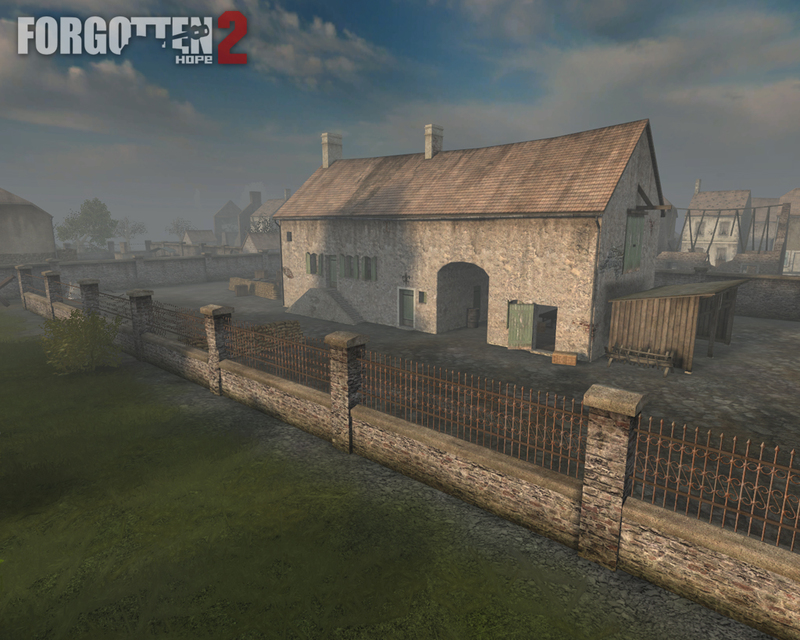 This week, we would like to present the first map planned for the Normandy Theater of War - Operation L�ttich. 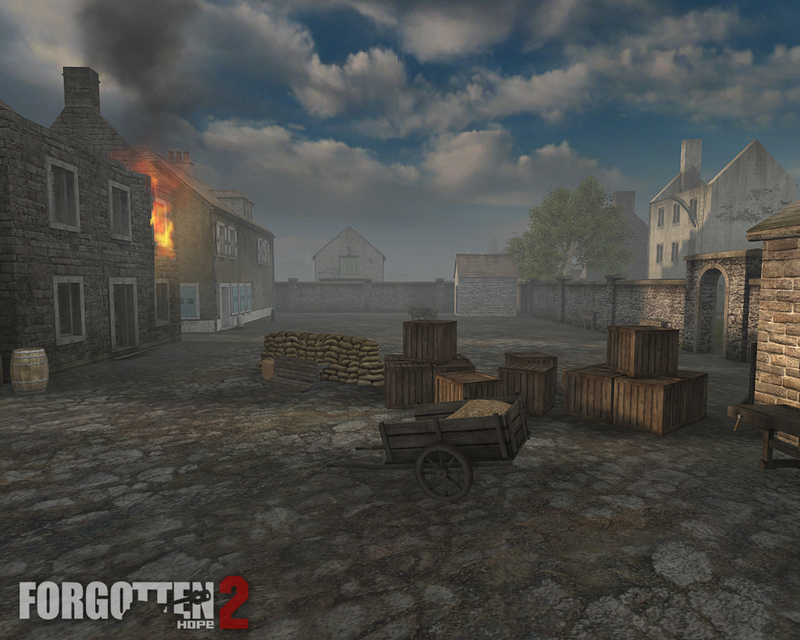 This map was made by Fenring, but on the screenshots you can also see static objects (buildings, trees, boxes, etc...) made by Toddel, Smig, Remdul, Matt.B, Malsa and Lobo. 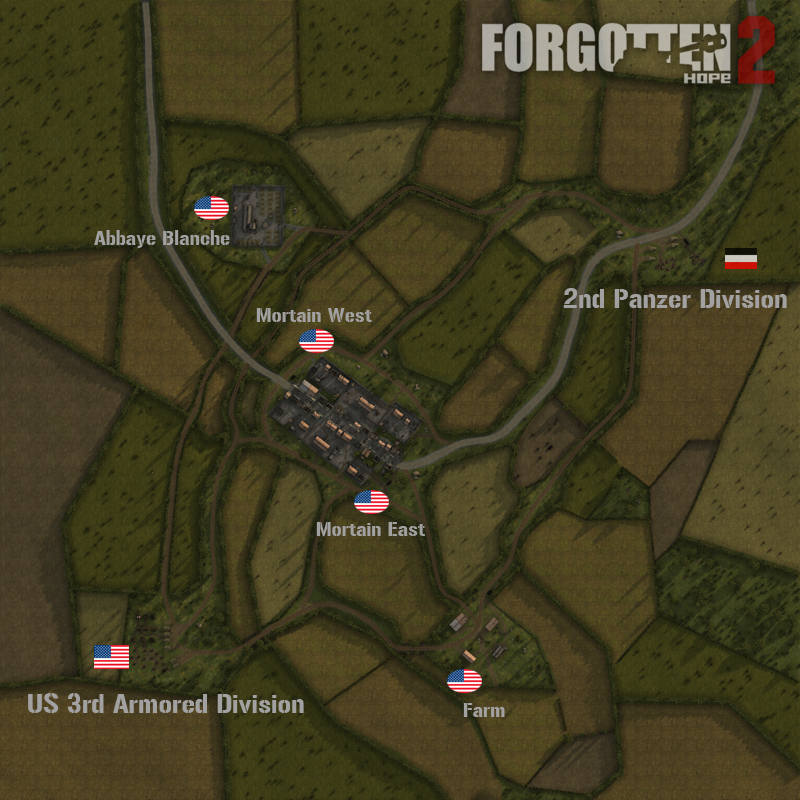 In early August of 1944 the German army in Normandy was facing a great dilemma. After weeks of stalemate, the Americans had finally broken through the western flank of the German line and they were rapidly advancing to the south and to the east. Like any sane military commander Field Marschall Von Kluge recognised the dangers of an encirclement and prepared to withdraw his forces to the east. The word retreat was however not in Hitler's vocabulary and he immediately intervened. Von Kluge was to launch a counterattack against American forces in the west of Normandy, with the objective of retaking Avranches and cutting off the Americans in the south. This maneuvre would be much like the one used in the First World War, during the battle of Li�ge (L�ttich is the city's German name) which took place exactly 30 years earlier. 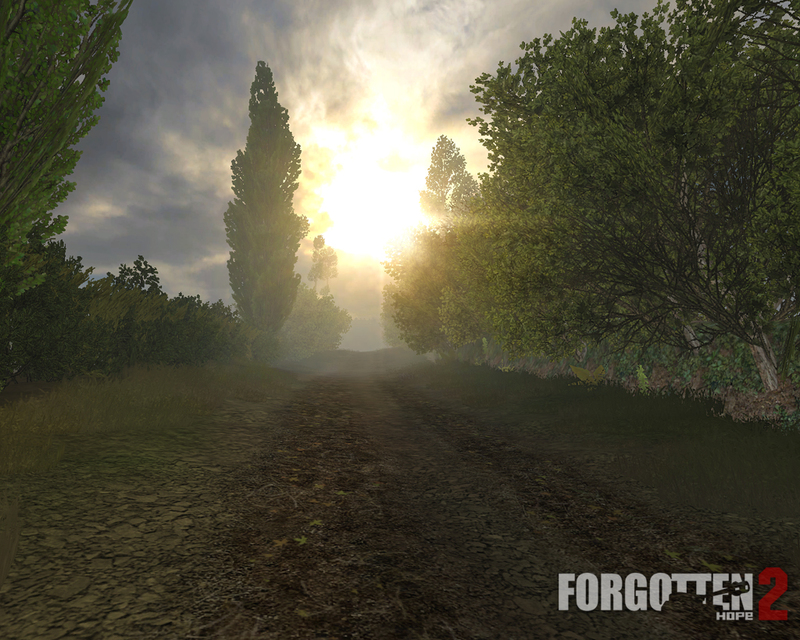 Hello and welcome back to another update of Forgotten Hope. This week we have more toys for the Germans, but before we show those we would like to welcome two new devs to the team. First we have Bender64, a very skilled modeler and skinner, who made this week's FW190. Second we have Bob Sacamano, a talented movie maker, who made the trailers for 2.0 and 2.1. Welcome! 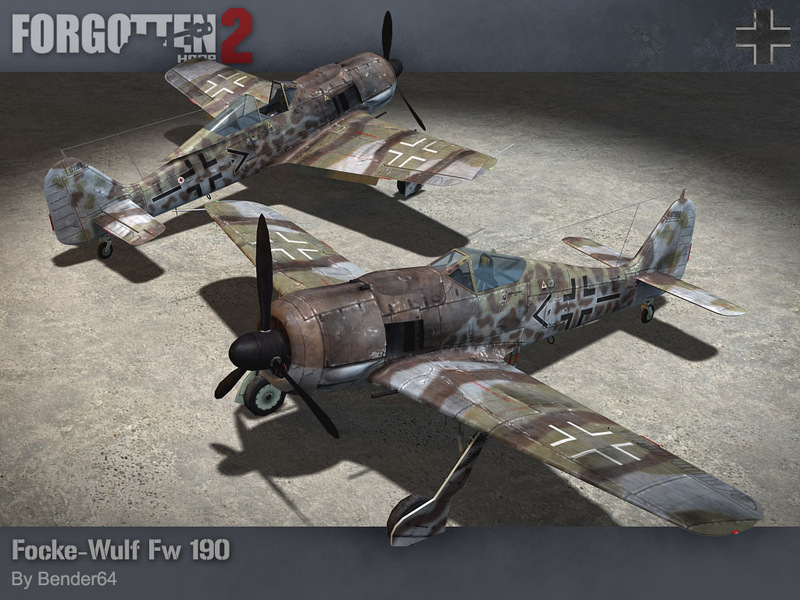 Today we'd like to show you the German Focke-Wulf 190 and the Gewehr 43. 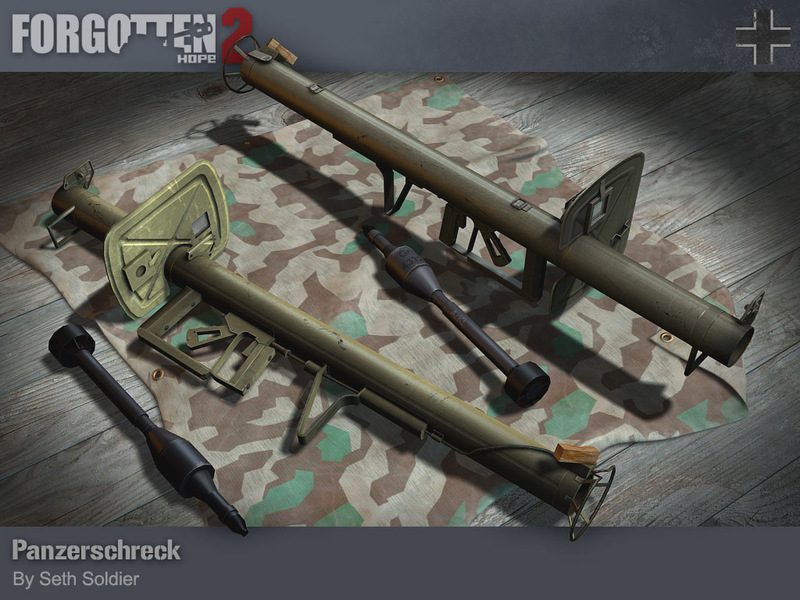 The Focke-Wulf was modeled and skinned by our new dev Bender64 and the Gewehr 43 was modeled and skinned by Seth Soldier. The development of the Focke-Wulf FW190 started in 1937, when the need for a more advanced airplane to fight alongside the Messerschmitt 109 was anticipated. The first prototype flew in 1939 and by the autumn of 1941 the first of the new fighters were delivered to the front lines. The FW190 quickly proved to be superior to the Spitfire model of that time and it was generally considered to be a good plane by its pilots. Later in the war other models of the FW190 allowed it to be used as a fighter-bomber and ground attack aircraft. In total 20,000 FW190s were made during the war. In 1940, the need for a semi-automatic rifle arose in the German army and both the Walther and Mauser companies were instructed to start working on a design. This led to the G41(W) and G41(M) and although both rifles performed very poorly, the Walther Gewehr41 was clearly superior and the Mauser and this model was canceled. In 1943, Walther developed an improved version, the Gewehr 43, which proved to be much more reliable. 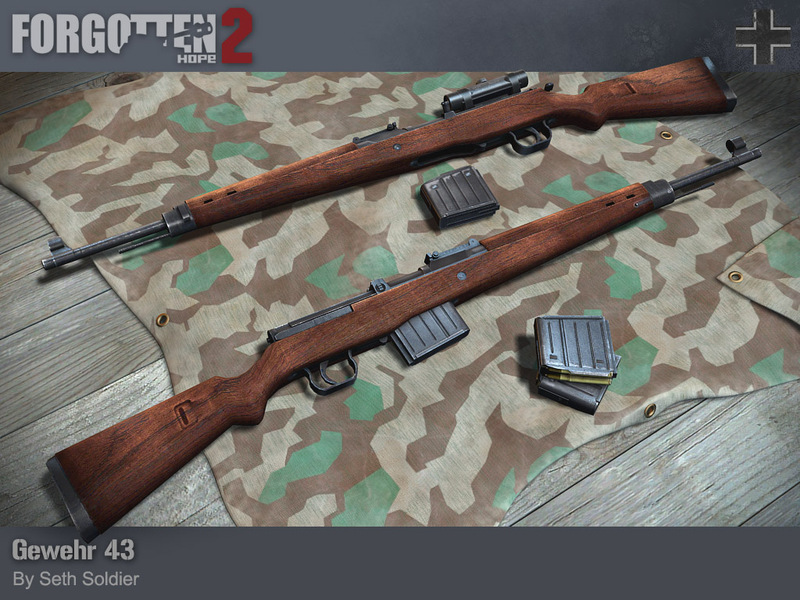 In 1944, the rifle was renamed the Karabiner 43 (K43). Over 400,000 of these new rifles were manufactured in the war. 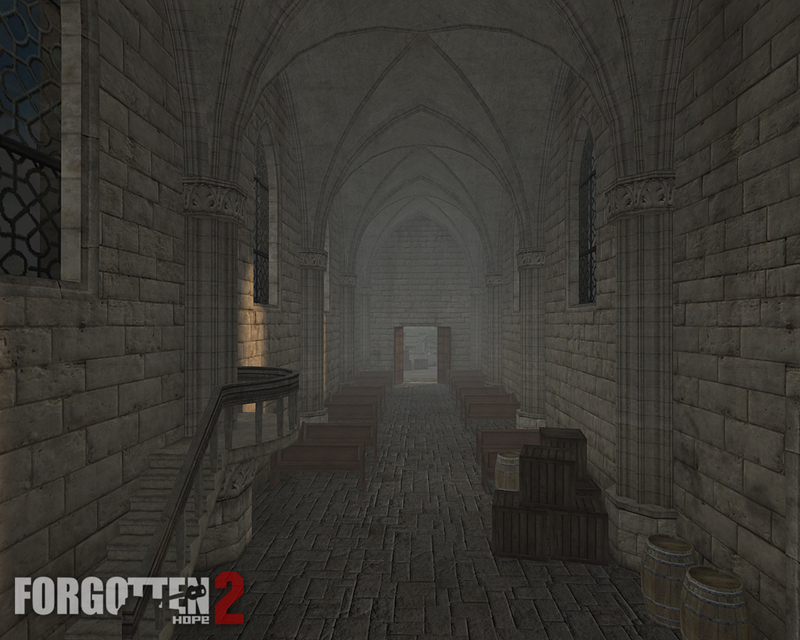 Hello and welcome back to another update of Forgotten Hope. 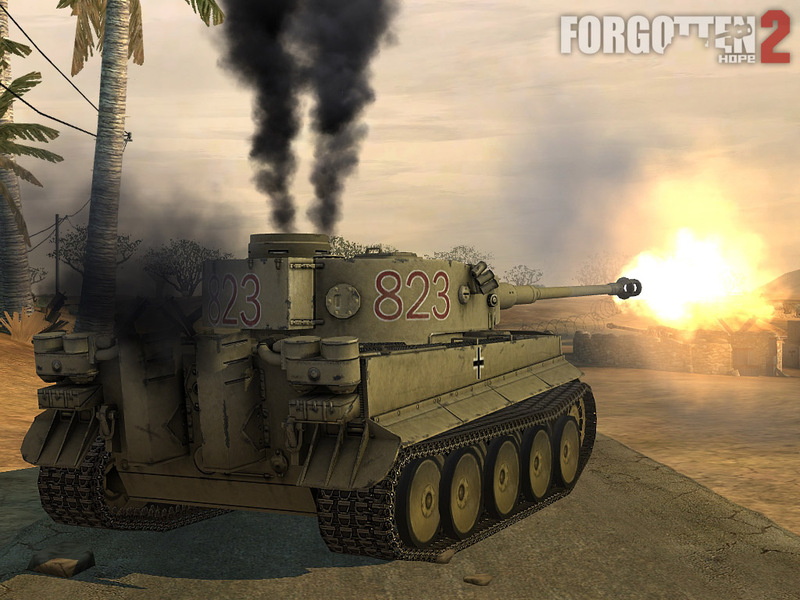 Today's news item is no doubt the most requested and anticipated vehicle for Forgotten Hope 2, so without further ado we would like to present the Tiger! 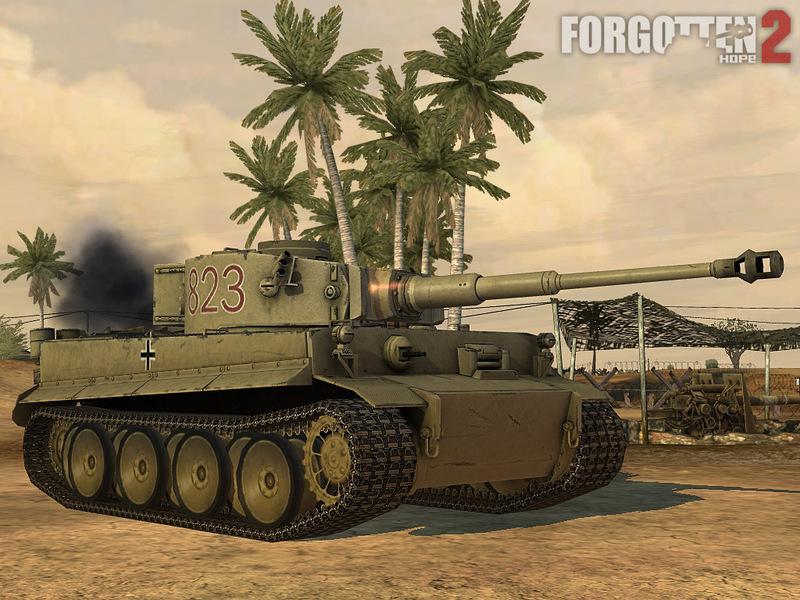 As you can tell from its sand-coloured skin, this is the early Tiger I model, which was used in North Africa. In patch 2.15 you will be able to find this vehicle on the Mareth Line map. 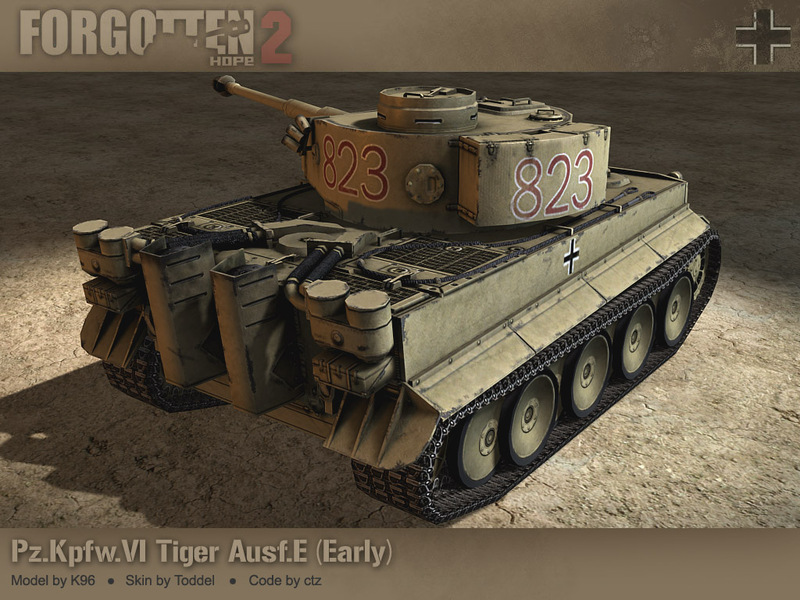 The Tiger was modeled by K96, skinned by Toddel and coded by ctz. 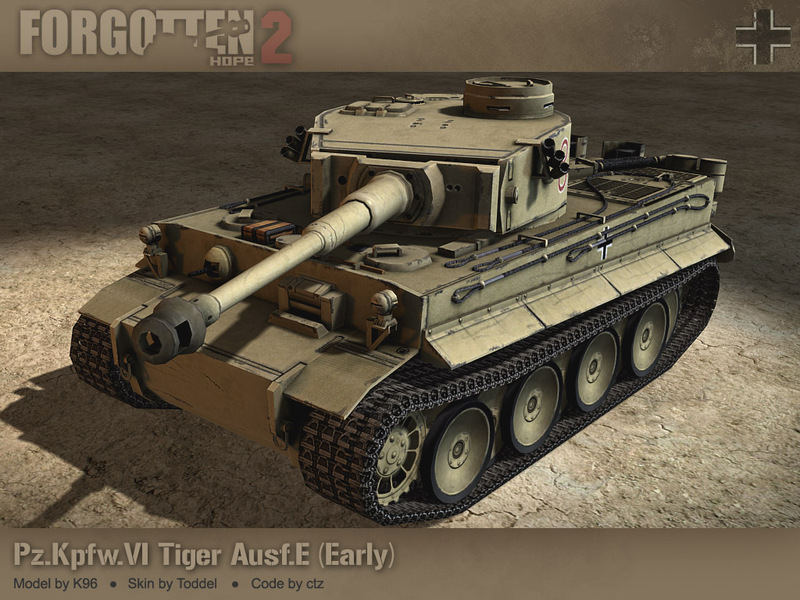 The development of the Tiger I started in May 1941, when the order was given to Porsche and Henschel to design a heavy tank that used the 88mm KwK L/56. Over a year later in July 1942 when both prototypes were tested the Henschel Tiger proved to be the better one and was approved for production. Only two Heavy Tank Battalions (the 501st and 504th) equipped with Tigers were sent to North Africa, having only 20 Tigers each. Although the first of these Tigers arrived in November of 1942, the last of them were still waiting to be shipped in Sicily when the Axis forces in North Africa Surrendered. 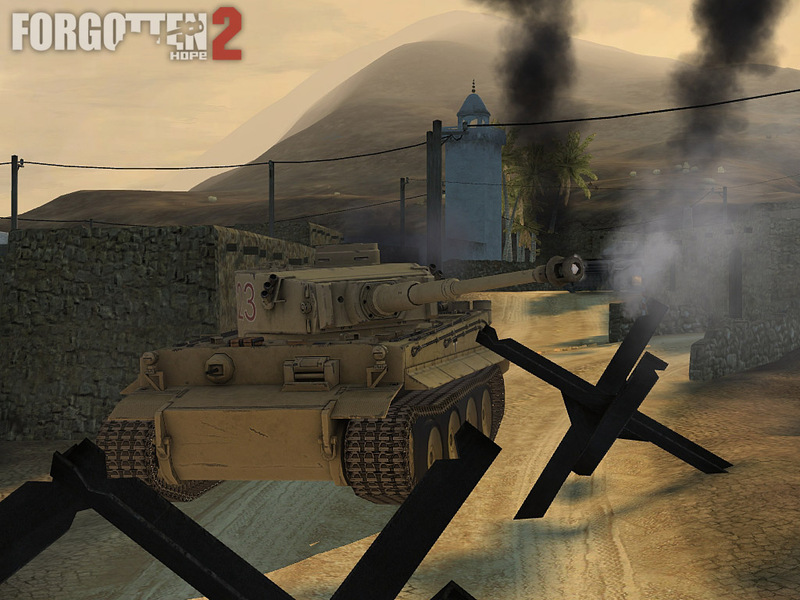 Despite their small numbers, the Tigers in North Africa left a lasting impression on the allies forces. 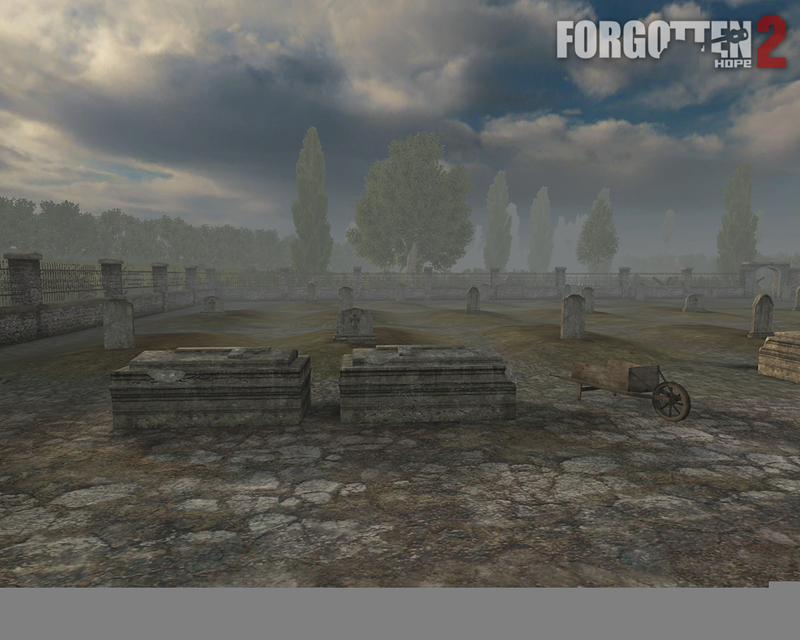 Hello and welcome back to another update of Forgotten Hope. 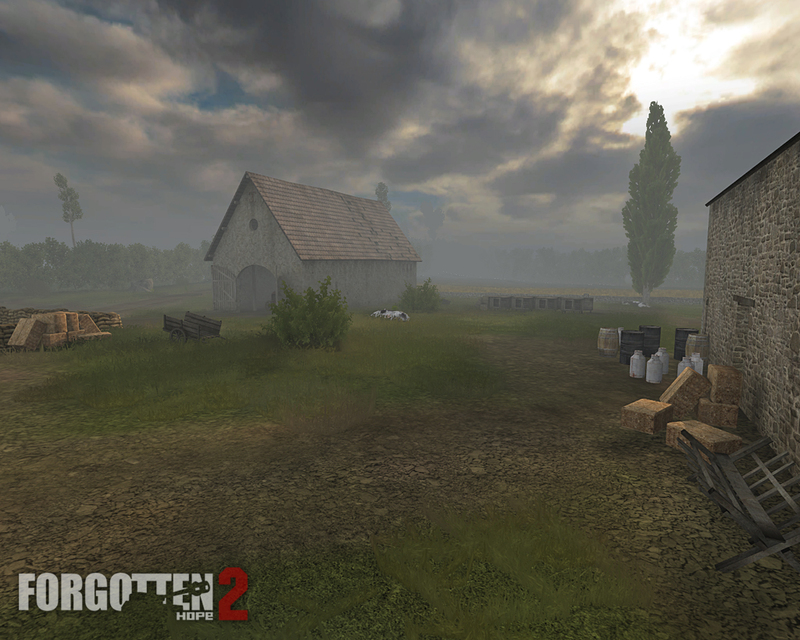 Today our news is all about Normandy again. 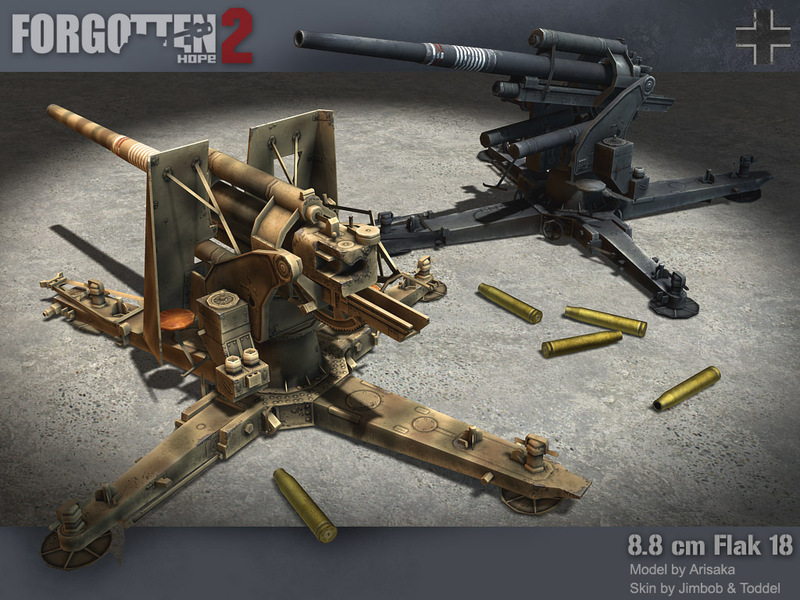 We have two new skins to show, that will make two of our existing artillery guns ready for the new theater and we also have a completely new model - the German Panzerschreck. 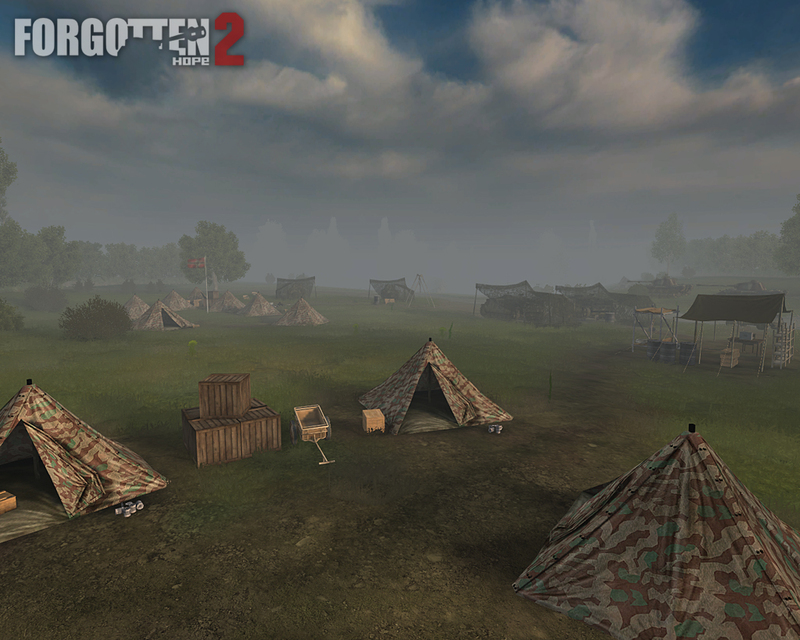 The two guns we have updated are the German 88mm Flak 18/36 and the British Ordenance QF 25-Pounder. 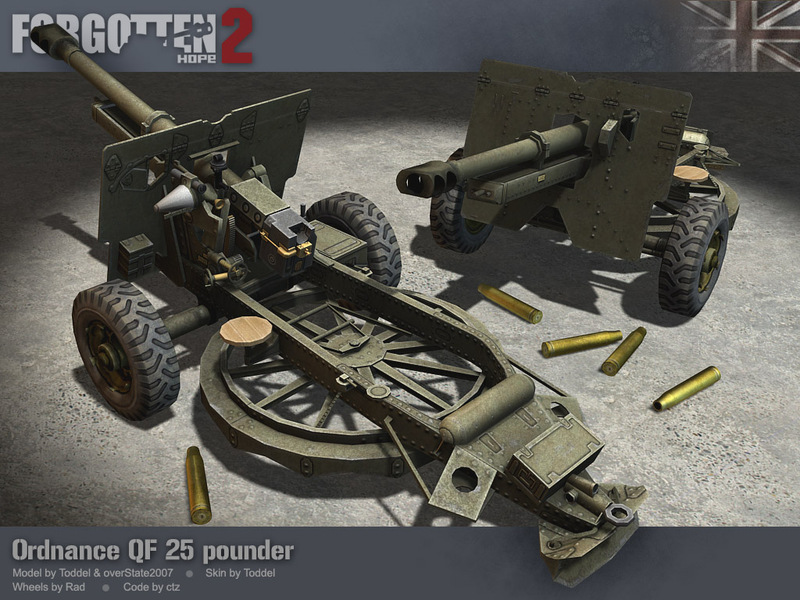 Both guns have received new skins, but the 25-Pounder has also been updated to a newer model, the Mark IV. You can tell the difference between this version and the earlier version in FH2 by the addition of a muzzle break. All the changes to both guns were made by Toddel. The last item on display this week is the Raketenpanzerb�chse 54, better known as the Panzerschreck ("Tank Terror" in English). This new anti-tank weapon was made by Seth Soldier. The German army quickly realised the potential of the new HEAT shaped charge weapons. Their own development eventually led to the panzerfaust weapons, but when they encountered the American M1 Bazooka in North Africa and later in Russia, they quickly took the weapon's design and improved it. 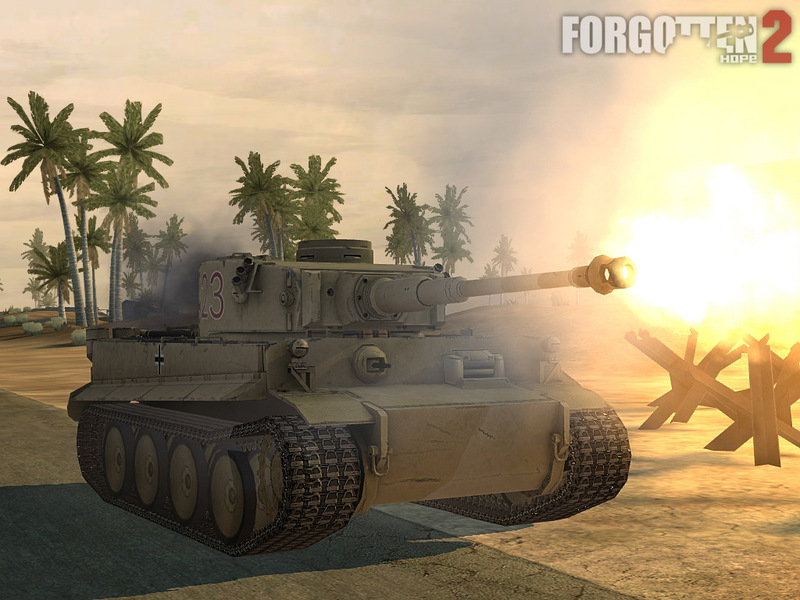 The result was the 88mm Raketenpanzerb�chse 43. Although this weapon was incredibly powerful, it created a large backblast, forcing the operator to wear protective clothing. In October of 1943, the weapon was improved by adding a blast shield to protect the operator and it received the name Raketenpanzerb�chse 54. Although based on the American ones, the German rockets were much larger and as a result were able to penetrate nearly twice as much armour as their American counterparts. We also have an advertisement this week for a new Forgotten Hope 2 Tournament, check it out. The 130th has decided it's about time we gave something back to the community that has cradled us for four long years, and here it is! A chance for all of us FH'ers around the World to meet and greet and get to know eachother by doing the one thing we all do best, beat the tar out of each other!Every clan currently active for FH2 is welcome to join our Double-Elimination Tournament. *NOTE*- This is not a Campaign Tourney like WAW, this is a straight up Tourney. THERE CAN BE ONLY ONE!!! * We have two servers to dedicate to this event, both holding 48 playersat maximum. * Stop by and register on ourforums. 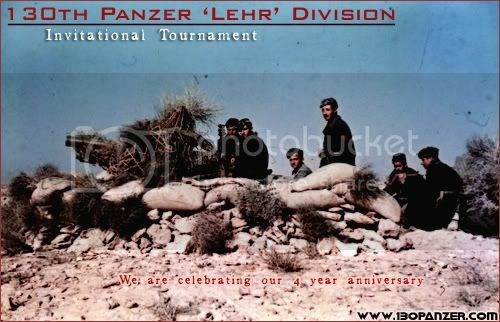 * Tournament Registration and Rules can be found at the 130th Panzer LehrWebsite in the Tournament Signup section. We hope that our enthusiasm for this event is matched, and exceeded, by the greatest mod community on the Planet! So sign up now! 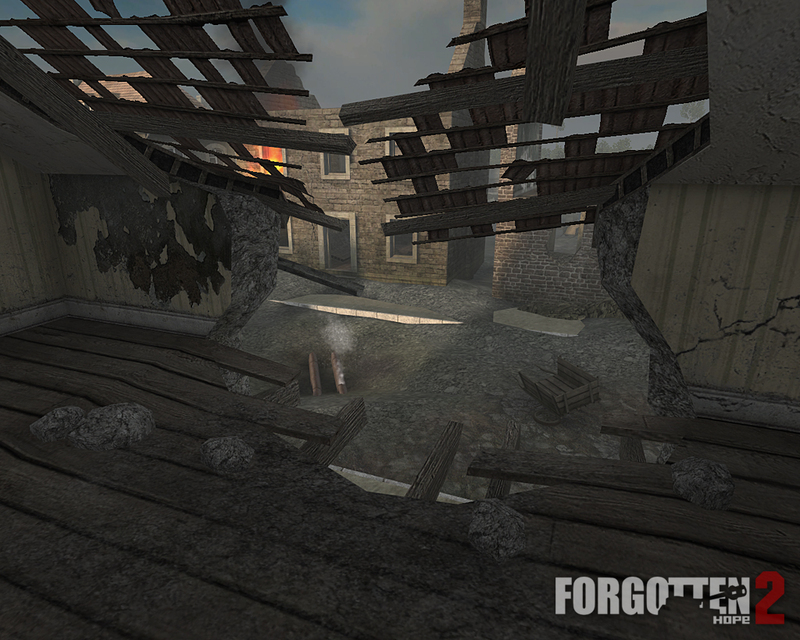 Hello and welcome back to another update of Forgotten Hope. 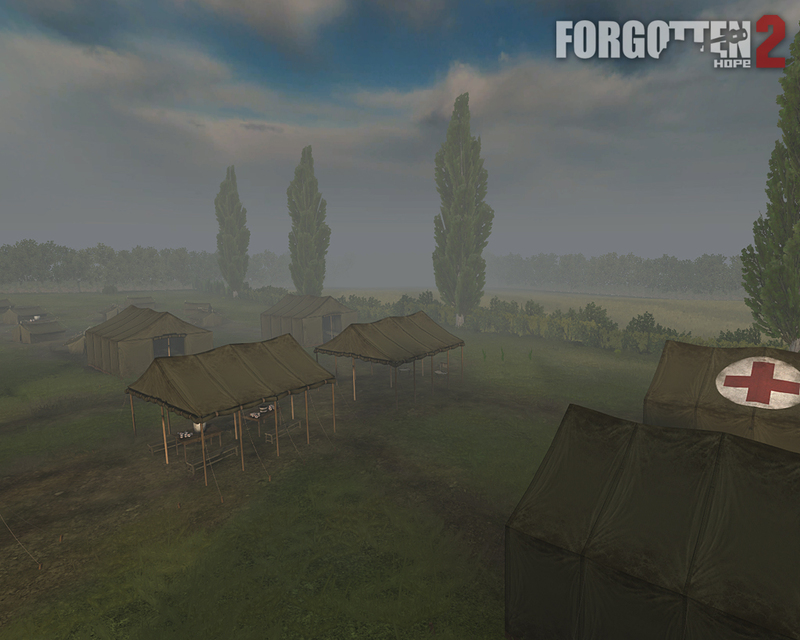 Today we will be showing you what we have in store for the Italian army in our upcoming 2.15 patch. 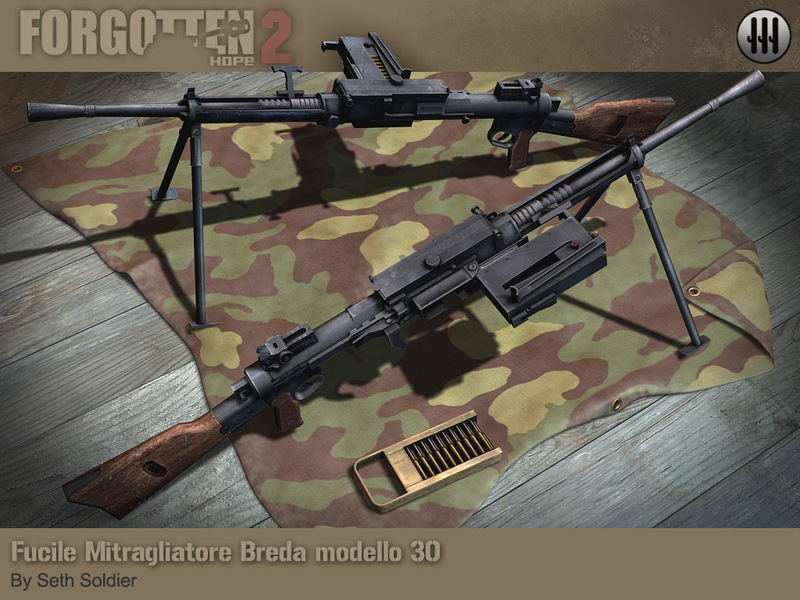 As you may know, we already had some Italian equipment in previous versions, but in 2.15 we hope to give the Italian army a more complete arsenal of small arms. 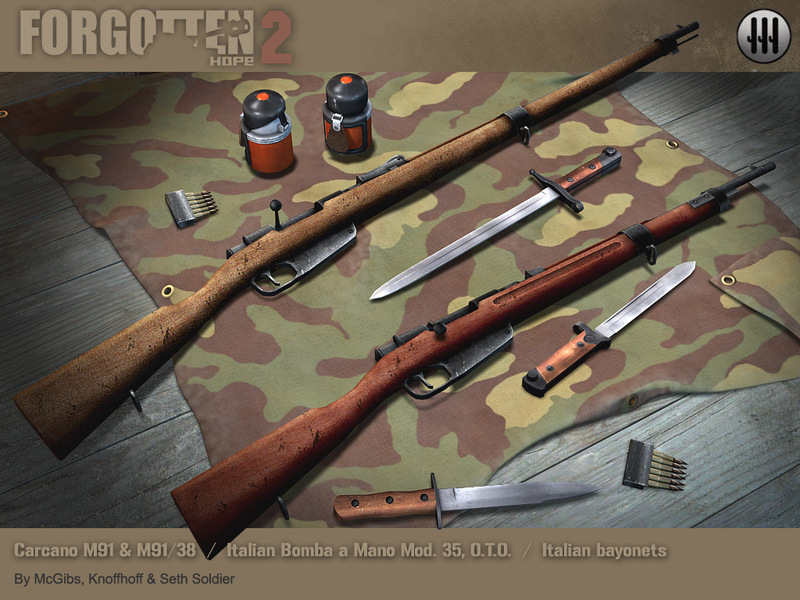 In the first render we have the two Carcano rifles, ported for FH 0.7, which were made by Mc Gibs - The bayonets for the Carcano rifles and the M39 combat knife, made by Seth Soldier and - The Bomba a Mano 35 O.T.O, made by Knoffhoff. In the second render we have the Breda 30 light machinegun, made by Seth Soldier. The main rifle of the Italian army in the Second World War was the Carcano rifle. There were many variations on this rifle, but the most common were the old M91 (from 1891) and the newer M91/38 (from 1938). Interestingly these rifles use different calibers. The old 6.5mm caliber as used in the M91 was considered to be too weak and was to be replaced with the larger 7.35mm caliber. When the war started though, the adoption of the new caliber was not complete, in fact, even during the war it proved impossible to completely replace the old 6.5mm caliber, so both were used. The M91/38 Carcano is perhaps better known for another role it played in history, as it was the rifle used to assassinate US president John F Kennedy in 1963. The Breda 30 was the standard light machinegun of the Italian army in World War 2, although production of the weapon had already ceased in 1937. It is widely regarded as an extremely poor machinegun. Its magazine capacity was only 20 rounds (of the weak 6.5mm type) and it fired at a low 500 rounds per minute. Its design was complex, leading to high production costs and due to the blowback system it used it was highly prone to jamming, especially in the African desert. The Bomba a Mano (hand grenade) 35 O.T.O. is an Italian offensive grenade that exploded on impact. To use the grenade, you would have to pull out the safety strip by the leather handle, unlocking the black safety lever (the cap). When thrown, the safety lever would catch air and be separated from the body, thus unlocking the safety bar between the firing pin and the primer. This mechanism had a tendency not to work however and the grenades were extremely dangerous in their unexploded state, leading to the British giving them the nickname "Red Devils".